This is from a home impacted by a near approach of a large forest fire. 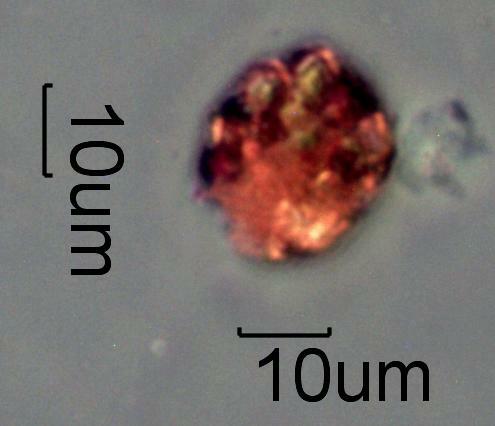 The air drop of this material creates a significant population of these particles though they represent a small fraction of the mass of the total drop. This particle shows some charring of the organic portion of the particle. The red fire retardant dropped from airplanes on forest fires is a mixture of ammonium phosphates, ammonium sulphates, pigment, a binding additive, and other chemical compounds in a water based slurry. One common formulation is ammonium polyphosphate, diammonium phosphate, monoammonium phosphate, diammonium sulphate, iron oxide (hemetite) pigment, guar gum, and other "performance additives". Other formulations are similar but may contain a sub-set of these compounds and may be colored with a dye that fades with time.